It’s summer, which means barbecue season (when it’s not raining) which, in turn, means burgers! Ok, so some of you may be a bit burgered out by now. Just how many quarter pounders can one manage in a single summer?! But just because you’re having burgers every weekend at various barbecue gatherings doesn’t mean you can’t mix it up a bit. Next time someone invites you round and asks you to bring something for the barbecue, don’t pop into your local supermarket on the way to grab whatever this week’s summer meal deal is, make something yourself and give everyone something a bit different. 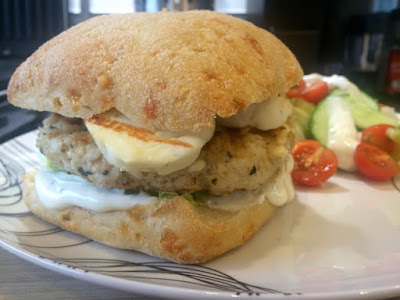 Turkey burgers are leaner and lighter than your average burger and using turkey rather than beef mince gives it a totally different flavour. 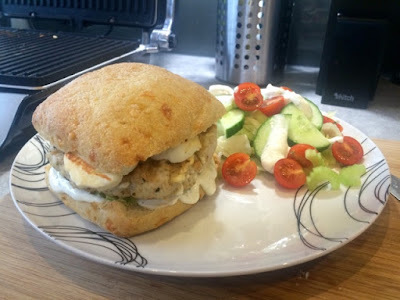 I’ve gone for a Greek twist with feta in the burger mix and adding tzatziki and halloumi as scrumptious burger fillings. Who needs plastic cheese and ketchup?! I think these simple swap outs make the whole thing more refreshing and just a bit more interesting. With the ongoing gourmet burger trend there are endless combinations you could use to liven up the classic burger, try lamb burgers with minty yoghurt dressing or even stick to your beef burger but swap the cheese for something different like a stilton. Any dips you might find at the barbecue such as humous or guacamole make great alternatives to boring old ketchup. Aside from the barbecues though, these burgers are also great for midweek dinners, the uncomplicated prep and cooking processes make them really quick to make and they’re very child friendly. This is also a great recipe to make up in a batch, store in the freezer and pull out for a lazy day. Even if you’re not going to make the turkey version I’d recommend homemade burgers for quick and easy family dinners anyway. The biggest bonus to making them yourself is, as always, you know exactly what’s gone into them. No additives and no crazy amounts of salt. I’d even go so far as to recommend making breadcrumbs yourself. 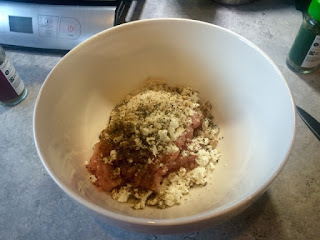 Don’t buy a tub, there’s always a stale slice or two left at the end of a loaf, whenever I have a few, I blitz them up in the blender and add them to my pot of ready to use breadcrumbs that I keep in the freezer. Gone in sixty seconds and with no waste! Serve these at a barbecue or as a family meal with a side salad, or if you’re feeling more indulgent some homemade fries. 1. Put all of the burger ingredients into a bowl and mix together thoroughly until a big ball of meat ‘dough’ is formed. The most effective way of doing this is just to get stuck in with your hands but use a spoon if you don’t like doing this. 2. 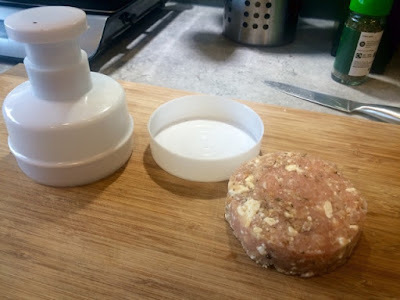 Split the dough in two and either use your hands to shape into two patties or a burger press to form a nice neatly shaped burger. 3. Preheat your grill. 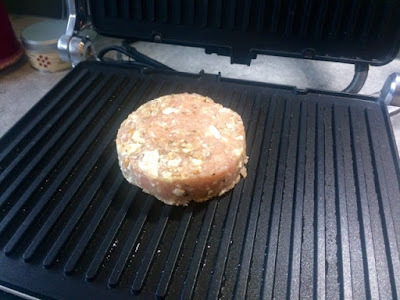 If using a freestanding grill like mine, heat both sides to 200ºC and cook between them for five minutes. If using a grill pan on the hob or in the oven or on the barbecue, do five minutes on each side. Alternatively, bake for 10 minutes at 200ºC. 4. 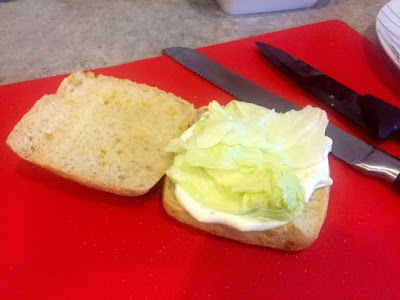 While the burgers are cooking spread the bottom half of your buns with a good dollop of tzatziki and top with the lettuce leaves. 5. 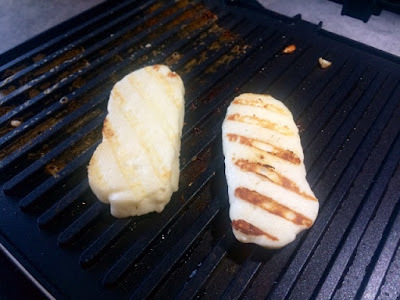 Either alongside your burger for the last few minutes of cooking or after they are finished, place the halloumi slices on the still hot grill, cooking until hot and lightly charred on each side. 6. 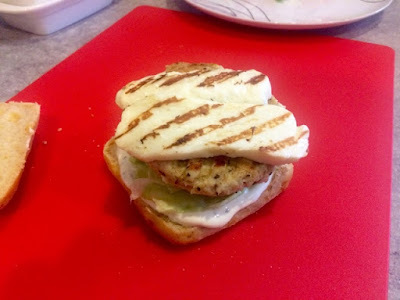 Place your burgers in their buns on top of the lettuce and top with two slices of halloumi on each. 7. Serve with a side salad or homemade fries. 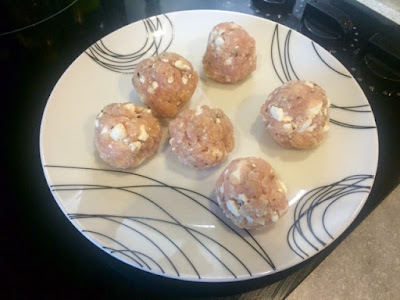 Top tip: If you’ve got more mince and don’t know what to with the rest of it, double the quantities of the rest of the ingredients and once you’ve made your burger patties shape the rest into meatballs, either to be served with spaghetti the next day or to store in the freezer for another time. 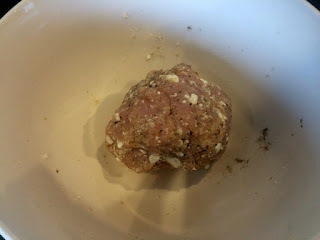 This also works if you’re only cooking for one, I made myself one burger for my dinner and turned the rest of the mixture into meatballs for the following day.